Many sports fans consider this the best week of the whole year. The NCAA basketball tournaments excite many with filling out brackets, deciding on favorites, and identifying sleepers. The allure of these basketball tournaments may be because we get to watch student-athletes playing their hardest, as if the game may be their last. For many players, it may be their last game. Teams will battle it out with many games coming down to the last shot. 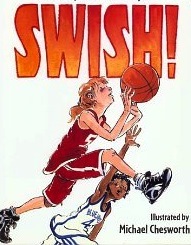 Bill Martin Jr. and Michael Sampson capture this riveting moment in the book, Swish . The Blue Jays and the Cardinals trade baskets in the final seconds. It is Cardinals that have the ball last. Will they hit the last shot and win the game? I couldn't find a better book to begin a birthday celebration for Bill Martin Jr. You will be engrossed with this book in the same way we glue our eyes to the television for those last few seconds of a NCAA tournament game. I am often intrigued by many of the stories I read about authors. Initially, the story of Bill Martin Jr. being unable to read a whole book until his freshman year of college was shocking. He had to rely on his strength of listening to get through school because of his anxiety and fear of reading. Michael Sampson, collaborator and Martin's best friend, described Bill by saying, "if he could hear it, he could read it." His adaptation and reliance on rhythm found him success in reading. All of this ultimately led him to be one of the most recognizable names in the field of children's literature. Bill Martin Jr. often started with a rhythm before writing the words to a story (Eric Carle describes this in a very moving short video clip). In the books, Chicka Chicka Boom Boom and Chicka Chicka 123 (illustrated by Lois Ehlert) the rhythm of the words get stuck in your head like your favorite song you just heard on the radio. My children have never gotten tired of listening and singing along to the audio CD and Scholastic Storybook Treasures DVD of Chicka Chicka Boom Boom. I thought of a little craft while I was reading Chicka Chicka 123. I knew we had big paper, paint, an old apple, and foam sticky numbers. 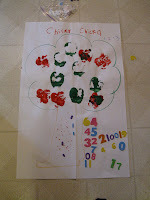 I thought we could make our own apple trees using the apples as stamps. To begin, I cut the apples in half. 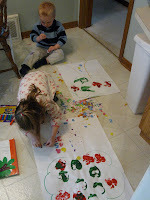 Then, we pressed the cut white part of the apple in the paint and stamped them on our tree. After that, we arranged premade sticky foam numbers, that can be found at most craft stores, all around to show them moving up our apple tree. Another interesting story from Bill Martin Jr.'s life is that Brown Bear, Brown Bear What Do You See? was written on a train, in about 15 minutes, on a piece of newspaper. Pairing that moment of brilliance with the unmistakable artwork of Eric Carle made this one of most influential books for young children. This book is treasured in our home. Our copy, given to my daughter by her great uncle when she was a baby, has been read hundreds of times by all of our children. When we read this book we love to make the sounds of all the animals in the book. This practice is actually more fitting for Polar Bear, Polar Bear, What Do You Hear? , but it effectively keeps my kids active listeners, especially, when trying to make noises like a goldfish. There are two other books in the series, Panda Bear, Panda Bear, What Do You See? and Baby Bear, Baby Bear, What Do You See? that are also wonderful read alouds. Bill Martin Jr. said he "believed in children." As a former teacher and elementary principal, Martin wanted everyone to succeed at reading. He remembered the feeling that he had when he finished his first complete book. He wanted all children to feel that accomplishment by the time they reached first grade. Therefore, he wrote his books with that goal in mind. I am truly appreciative of his work and will enjoy celebrating his birthday this week with my family. 5. 40th Anniversary Brown Bear Activity Guide - Very Nice Activity Packet! 9. Scholastic Author Study - Bill Martin Jr. This post was originally written in Marc 2010, but updated in March 2011.
thanks for following my blog, and kidos for your blog. Great work and interesting information.